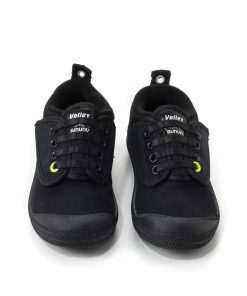 these high top unisex sneakers are the result of our collabo with volley, the iconic australian sneaker brand. our mini skull logo print goes all over in understated grey on black. a pop of neon at the eyelet brings classic flyness to a shoe that works hard for the modern boy or girl out & about in the world. let them explore in style.